The Arkansas River begins in the melting snows of the Mosquito Range near Leadville, Colorado. Before it reaches the Mississippi in Southeast Arkansas, it passes from mountains thorough plains, prairies, hardwood forests, cities, and cypress swamps. William Mills’ 151 color photographs, illuminating an informative and provocative text, record his own journey down the river’s course. 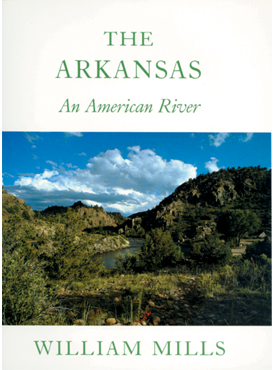 Written with both a poetic and ecological awareness, The Arkansas is not only and exploration of the wild and domesticated—often devastated—banks of a great American river. It is a philosophical consideration of humanity’s relationship to the natural world. Ecologists, campers, birdwatchers, fishermen, naturalists, and anyone who has ever lived beside or loved a great river will enjoy Mills’ passionate story of the Arkansas.